So you want carpet, but you know your precious pet has tendencies to leave accidents in your home from time to time. With the technology that exists today, the comfy feel of carpet that was limited to non-pet owners is a thing of the past! It is 2014 afterall and the carpet technology that exists today will blow your minds. 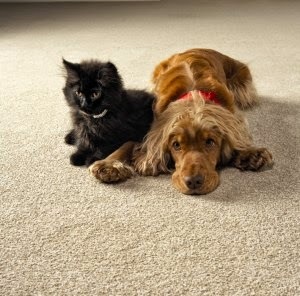 There are many carpet manufacturers that offer pet-friendly carpet. The one I want to introduce to you today is my new personal favorite: the tried-and-tested Beaulieu Bliss line called Indulgence. It is crazy soft carpet with ultimate family and pet performance. Bliss Indulgence is constructed with the company's incredible patented 100% solution-dyed nylon fiber that is extremely colorfast and stain resistant. Additional features include Beaulieu's own Magic Fresh treatment that reduces common odors such as pet, cooking, and smoking odors. Taking it a step further, Bliss Indulgence has another special ingredient called Silver Release. Currently, the Indulgence line plans to have 7 styles across 100 sku's. Bliss Indulgence carpets will never permanently stain or fade thanks to Permasoft Solution Dyed Nylon fiber. You can even clean stubborn spots with a 50% bleach and water solution. This carpet brings several industry-leading features together - some for the first time in a single collection. Beaulieu's Wrinkle Guard Protection is introduced as part of Bliss Indulgence. Wrinkle Guard is a new carpet backing that guarantees lays flat, stays flat performance. The fact that it doesn't pull up, helps tremendously when your larger household pets walk over your carpet. The Bliss Serenity Guarantee is also being introduced as a package of protection with Bliss Indulgence that includes a Lifetime No-Exclusion Stain Removal Warranty, as well as a host of other category-leading warranties. 1) Solution-dyed nylon means the color is built into the fiber. Take a carrot for example. A carrot doesn't fade or stop being orange because you peeled or cut through it. Same goes for a solution-dyed nylon fiber. It will not fade against the sun and you can even clean it with a diluted bleach mix. 2) Pet urine and other unwanted stains can be cleaned right away with a towel and warm water. To take it a step further, you can use a diluted solution of one part water and one part bleach.